I've already recommended them to a business associate. I think highly of them. I have been using them forever. They are very responsive and very good. I have no complaints. You get good quality service. They are always ready to help you, and they are very honest about what you need and don't need. Jerry has been with us for quite a few years. He takes care of all of our computers. If we ever have a problem, we call him and he takes care of us every time. Jerry has been prompt and we don't have long waiting periods. When we're down, they take care of us pretty quickly with good response times. If you have a problem with your computer, you should call them. They showed up when they said they were going to and they fixed the problem. They're a good company. Owner Donald Schrader founded Schrader & Son in 1997. Schrader & Son provides a wide range of computer troubleshooting services for residential clients in Contra Costa, Solano and Napa Counties, as well as commercial clients throughout the Greater Bay Area. The company offers general repairs, hardware and software setup, networking solutions, data protection and recovery, and more. It can handle jobs of all sizes, from personal computers for home use to fully networked and integrated office systems. For the convenience of its customers, Schrader & Son offers in-home service seven days a week and onsite business service five days a week. The company’s website also features helpful tips and links to free spyware and adware removal programs. 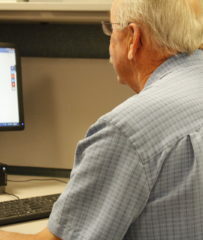 Owner Donald Schrader works on a customer’s computer. Schrader & Son starts each job with an assessment, either by telephone or in-person, and follows up with a recommendation and cost estimate based on experience. For commercial clients, a written estimate is usually provided for substantial hardware and software installation and replacement projects. For residential and commercial clients, Schrader & Son carries most common parts (such as hard drives and memory enhancements) required for worksite and home repairs. In some specialized cases, specific parts or software must be ordered. Most parts can be located and purchased within one day, save for a few proprietary items for unique systems. Schrader & Son also offers network wiring and installation, wireless setup and hardware sharing, Windows setup and configuration, network topography, new system consultation, and data transfers from old to new systems. Exercise caution when having your computer repaired. Computer problems can be frustrating—when a software or hardware problem can’t be resolved through “help” or FAQ websites, a professional service technician is often required. For consumers and small business owners without an information technology department at hand, resolving computer system problems involves finding a trusted source. Not unlike finding a good automobile repair shop or carpenter, getting the best service often comes down to cost and experience. “Sometimes, major retail or repair shops will quote $600 to fix a computer,” notes Don Schrader, owner of computer service and repair company Schrader & Son. “In many cases, these problems can be fixed in one hour.” It’s important to find a trusted source that has the knowledge and experience to solve small problems that don’t require starting from scratch or purchasing a new computer. While wiping a hard drive clean and reinstalling software and data can work for serious problems, it should only be used as a last resort. It can be expensive and time-consuming—rarely the best scenario for a small business owner or consumer. Q: Can you come to my house? Q: How long will it take to resolve my computer problem? Q: Can you help retrieve lost data due to a hard drive failure? Don Schrader is a 24-year veteran of the computer service industry and owner of Schrader & Son, a Diamond Certified company since 2008. He can be reached at (925) 385-8905 or by email. After his family’s business closed in 1993, Don went to work for another steel contractor, but it wasn’t long before his digital destiny came to fruition. “By this time, Rex had gone off to college, where he was majoring in computer programming,” he explains. “While visiting one summer, he suggested we put an ad in the paper for computer service. We started getting calls—Rex handled things during the weekdays and I helped out during evenings and weekends. That was the beginning of Schrader & Son.” When Rex returned to college in the fall, Don decided to keep the ad running. 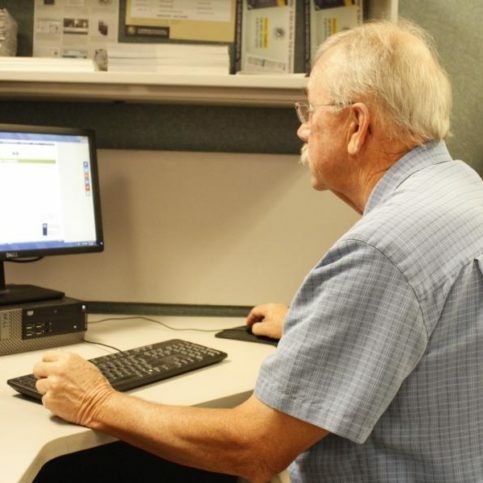 “Things got busier and busier until I eventually left my other job to do full-time computer service.” Twenty years later, Don is still serving a customer base that spans three Bay Area counties. A resident of Concord, Don likes to spend his free time relaxing and having fun, usually in the company of his wife, Colleen. “I enjoy golfing and traveling with my wife,” he affirms. “She recently retired, so we’ve been able to do a lot more of those things lately.” Don also enjoys spending time with his family, including Rex; his two daughters, Danielle and Bonnie; and his two granddaughters. Q: Do you consider yourself a dog person or a cat person? Q: What was your first computer? A: An Intel 8088. It was about the size of a portable sewing machine and it took 5 1/2-inch floppy disks. CONCORD — Malware has been around for a long time, and the computer industry has developed many good tools to combat it. However, today’s computer-based criminals are using a new technique: malware scams. In this instance, the malware itself isn’t the problem—it’s merely a decoy employed by scammers to scare people into providing access to their computers. One way malware scams take place is by phone. You might receive a call from someone claiming they’re with Microsoft. They’ll typically tell you they’ve detected a problem with your computer and need to get access in order to fix it. In addition to gaining access to your information, scammers will usually offer to fix your (non-existent) computer problem for a fee. They’ll run some scans and install some software to make it look like they’re doing something useful. Fortunately, this kind of scam is easy to avoid: just hang up! Microsoft would never call your home phone to tell you about a computer problem, so don’t be fooled. Another common malware scam is when a web page pops up on your computer that you can’t close. The page will usually give a phone number and tell you to call immediately, warning that your computer is infected and all your personal information is at risk. Naturally, this is alarming, but that’s the point; they’re trying to scare you into calling them. They don’t actually have access to your computer or personal information—they’re hoping to get that from you over the phone. Fortunately, as with the previous example, this situation is easy to get out of: simply shut off your computer and restart. When your computer reboots, the page will be gone and you can go back to what you were doing. CONCORD — Host, Sarah Rutan: Malware is a genuine concern for any computer owner, but sometimes what appears to be a threat may simply be a cunning hoax. Today we’re in Concord with Diamond Certified Expert Contributor Don Schrader of Schrader & Son to learn more. Diamond Certified Expert Contributor, Don Schrader: So, my tip today is — we’re going talk a little bit about malware and about those really annoying phone calls that you get from somebody that kind of claims that they’re Microsoft or they’re with Microsoft. And those are all a scam. If you get one of those, just hang up, please, because what they want is to access your computer, which you have to give them permission to. And then, they’ve got full access to your computer, and they’re going to look around. They’re going to see what’s on there. They’re going to figure out how much money they can collect from you for fixing your computer that’s not broken. And the flipside of that coin is the web pages that come up, and you can’t close them down, that say all kinds of crazy things like, “We have access to bank accounts. We have access to all your information.” And it just goes on and on, and it’s scary as the dickens. And that’s the whole point. They’re trying to scare you, and they always have a phone number that sometimes flashes. “Please call this number right away, immediately. Your computer’s infected. All your personal information’s at risk.” This is all a scam. Schrader & Son : Average 9.3 out of 10 based on 251 unique customer surveys of customer satisfaction. They did good work, and they were on time, so I was happy with the results. They showed up when they said they would, and that was a plus. He seems to be very honest and hardworking. He seems to have a good knowledge of what he's doing. He's personable, hardworking, and fast. He did a good job. I would give them their number. They've always been there for me and have fixed the problems that I've had, so I have no complaints. Extremely professional, they really know their business inside and out, and if there is a glitch or they have problems, they either figure it out or they will tell you what to do, so they're very reliable. I think the fact that they were just easy to contact. They were extremely helpful, they answered phone calls, and if I left a message, they got back to me as soon as they could. I was extremely satisfied. We have one contact person that was particularly well fitted for us. He's very friendly, and he knows what he's doing. I'd tell them that they're very reliable, and they know what they're doing. They're pretty reliable and available. Every time they come out, they fix the problem. Very dependable, knows his business, and he's always there to help me. I've worked with them for 10 years now, so I'm very comfortable. I would say they're very dependable, they come over right on the day that I call, and they always fix things up really well. I mean they've saved my life more than a few times and my computers. They know what is wrong, and they're able to fix it in a hurry, even though there have been all different types of jobs that I've had them do for me. It's not just Don either, but his helpers too. Obviously, when your computer is down, you don't want to wait, so I liked that they came over right away. They're usually there that day or the next day. They know my system very well, because I bought all of my equipment and my computer from them. He's a nice guy who did everything right. I would definitely refer them to a friend and tell them that they are exceptionally good, timely, and Johnny-on-the-spot. They get there very quickly, which is important with computers. The quality of their work, they're great. I think they're a good business, they do good work, and it's a great price. We only had a couple of questions, and I like Don Schrader. I would say they were good. That they fixed my computer, and they did it quickly. I would say they're a good outfit to work with. They're usually prompt and able to come out quickly to help you. They come out reasonably, within a day. They handled most problems that I have had very well.